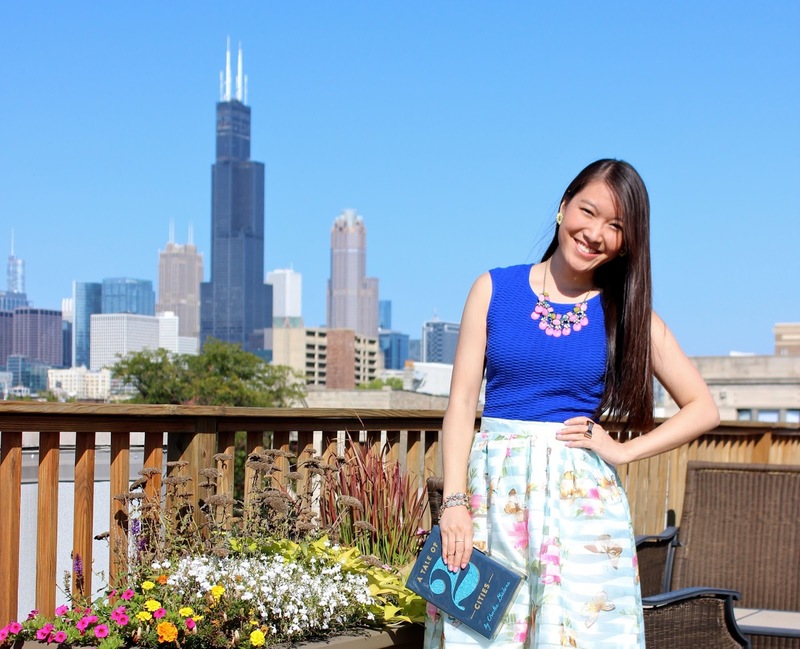 Grace in Style: STYLE STORY: BIRTHDAY WEEK! This week is super exciting because this girl is celebrating a new year of life! I can't believe I'll be a quarter of a century old...It's crazy how time has flown. I feel like I just started college, but since then I've received two degrees (another to be added in 8 months), had some fun adventures around the world and met some amazing people who have become my closest friends. Seriously!? God is so faithful! Something I try to do on my birthdays is sit back and flip through past pages of my adventure of a story; the permeating themes are His provisions, His artistry and His love for me. God's authorship is so evident. Yes, there was hard work involved, but I could not have gotten this far without His perfect plans for me. This past year has been the most difficult for personal reasons, but through the moments of belly laughs and the moments of ugly crying, He was and is always there. Amazing. This year, I'm especially thankful for my family & friends who have given me a shoulder to cry on, an ear to listen and also many fun memories. And I'm thankful for all my new friends who I've met here! It's the best thing to read all of your super sweet comments and encouragement! Seriously, YOU are incredible and so dear to me! 2. There is a new online magazine, FashionOPP, focusing on modest fashion and my look from the Nellcôte post was featured on the street fashion section on the same page as Blair Eadie of Atlantic-Pacific. What an honor! I almost peed my pants when I saw that. Not really, but if I had drank a cup of tea beforehand it could have happened...anyway, the first 1000 subscribers of FashionOPP, get a 1-year subscription for FREE! So sign up now! Now on to my birthday look. I know Fall is practically here, but I'm holding on to summer one last time because I can. Am I allowed to play the birthday card here?? But I'm also using this look to transition a bit to Fall trends. I know I say I'm not into what's "fashionable", but there are some things that make me happy to see on the runway! Pastels, for one, is my favorite since you can see me wearing them all year round. And florals are also a favorite year-round style habit of mine. I can't wait to see how everyone tailors these trends to their own styles! This necklace is one of my favorites from Benevolent Jewels. And you can score some of their gorgeous jewels and accessories for 20% off with my special code JHCODE20! They have an extensive collection of amazing personalized/monogrammed accessories that you can't resist! Thanks for reading! I hope you all have amazing weeks as well! If you have exciting happenings this week, please share! I'd love to celebrate with you :) Remember to wear love this week and be kind! 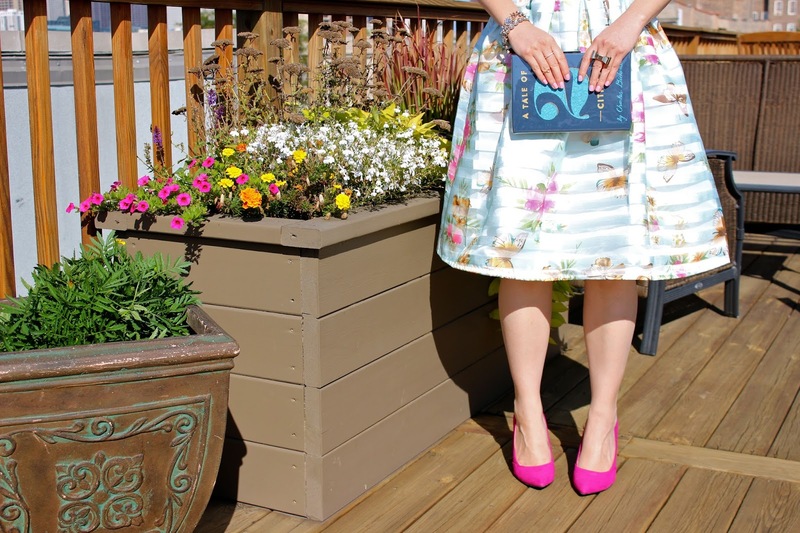 That organza floral midi skirt is gorgeous and I love how you styled it. I am wearing a similar (but more casual one) floral midi in my latest post. You look great. Enjoy this week!! Thank you so much Rochelle!! :) Their book clutches are the best! I'm also still in Summer clothing! Sounds like you've got lots of exciting things in store. Happy birthday! I love your outfit here. The top is so on trend being cobalt blue plus your skirt is stunning on you, I love the style, pattern and colours. Your bright pink shoes are fab! Thanks for visiting me earlier today, I really appreciate it. Thanks so much :) You are so sweet and I adore your style! How exciting for you! I wish that I lived in Chicago so I could see your modeling. How fun! Your look is so pretty and feminine. LOVE this outfit!! The coral top is fab but it's hard to take my eyes off that fuchsia stiletto! I love every piece and yet they look even more fab together!! Happy Birthday! 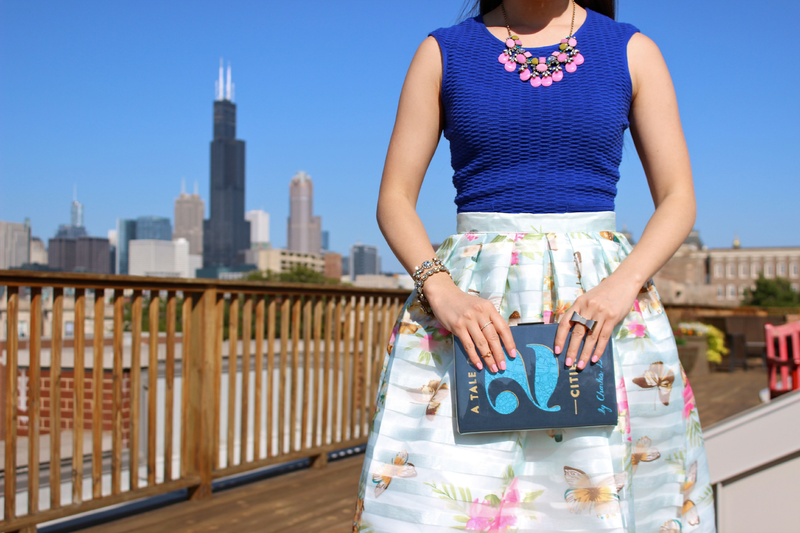 Love everything about this outfit - this skirt is just so pretty and feminine. Hope you will join my link up tomorrow! Thanks so much!! So sweet :) What is your blog site?? We should definitely follow each other!! I just joined your linkup! Love it! Beautiful outfit! Congrats on all the lovely things that going on in your life! Absolutely love this outfit! 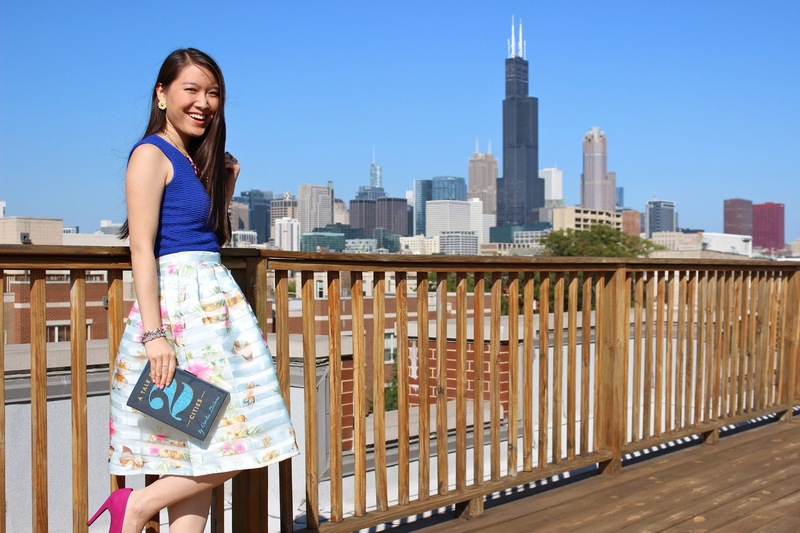 The floral skirt is gorgeous and looks awesome with the blue top and pink shoes. 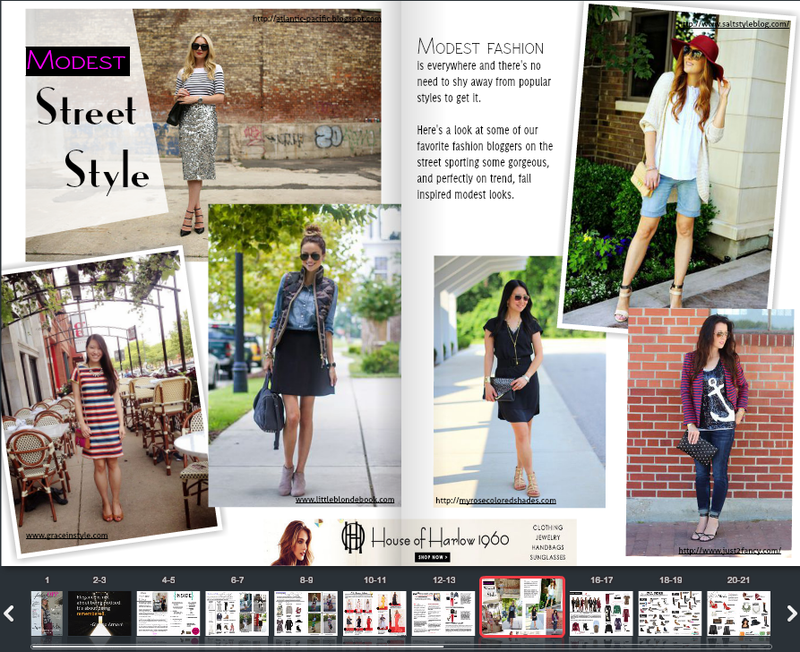 Thanks so much for giving Fashion OPP a shout out! I absolutely LOVE this skirt! You look adorable :). Thank you so much Tamara :) So sweet! inlove with this adorable skirt!! love how you styled it! Thank you so much Uris :) Hope you have a wonderful weekend! Your outfit is perfection - the skirt is adorable & those pumps are striking! 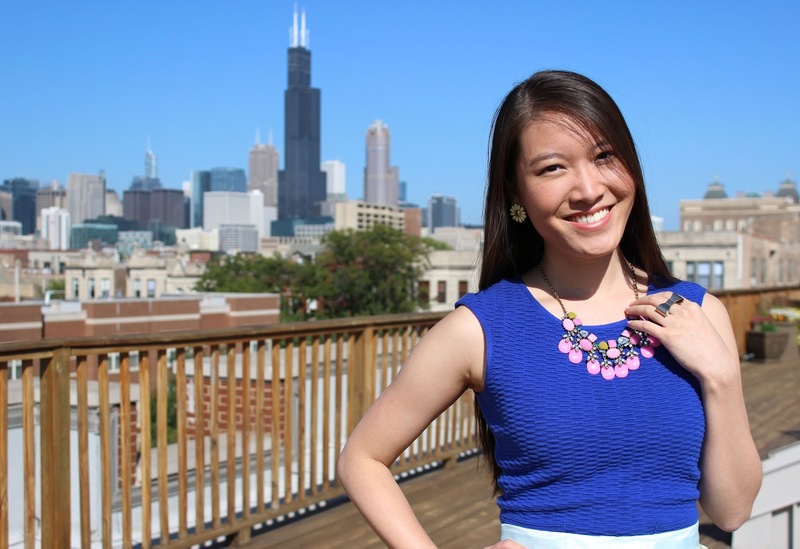 I am so glad to have found you via Passion4FashionLinkup. 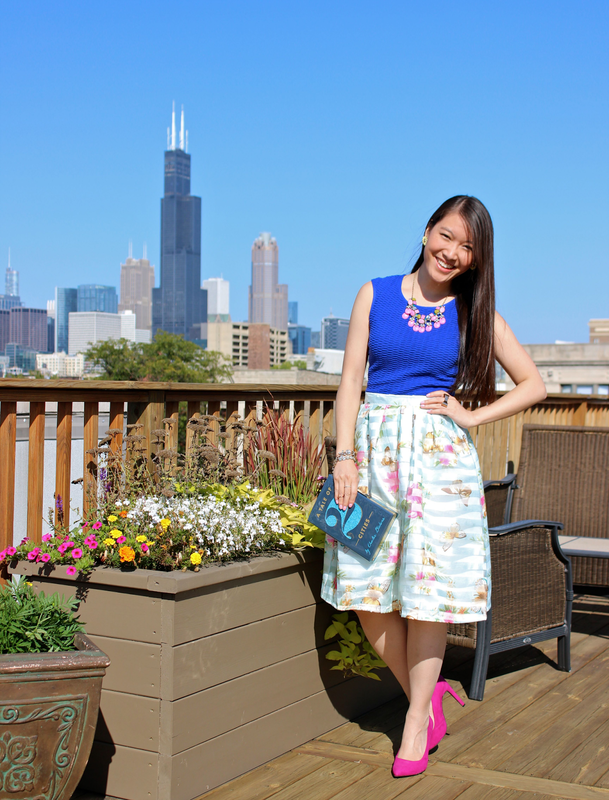 I love your outfit, the blue combined with the floral skirt and the fuchsia pumps and necklace looks great! Happy belated birthday!! What an honor to be featured in OPP. I really like your birthday outfit. Your skirt is so pretty! That skirt is amaaaaazing. Happy belated birthday.